There are apparently limitless ways to entertain oneself in New Orleans, one of which was to sign up for an air-boat tour of the swamps surrounding the city. Alas, air-boats are not wheelchair friendly, but my wife and son were ready and willing. The pilot of their air-boat was a certified merchant marine captain whose family owns the 4,000 acres of swamp available for the tour. He was a native Louisianian, a man whose great-great-etc. grandfather was a French fur trapper and explorer who married into a local Native American tribe. Funnily enough, when discussing his ancestry, he noted that the description Creole had come into disrepute in some quarters as a racist term. I had always thought that Creoles are a mixture of European, Native American, and African heritage, but apparently that's not so. In any event, Cajun is still acceptable. 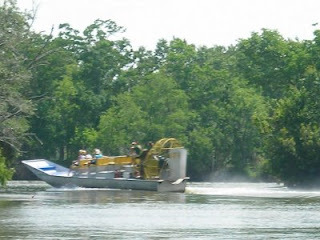 The pilot noted that his fleet of air-boats -- and almost every other available air-boat -- had been put to use scouring the swamps for debris in the aftermath of Hurricane Katrina. The clean-up took months, and thousands upon thousands of man hours labor. The alligators living on the family's swampland lived as alligators are meant to live -- that is, they are not "farmed" for meat and hides. The one exception to their wild life is being trained to approach the air-boats to be fed ... marshmallows. The training begins when their but hatchlings, mere inches long. The largest to approach the boat was about ten feet from nose tip to tail end. What a measly marshmallow might mean to a beast that size, the pilot didn't say. 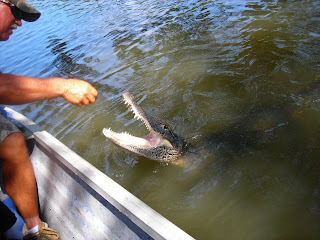 Alligators, though, are the most primitive of creatures. The pilot said they live only to eat and lack any sort of maternal or parental instinct. If the female loses too much body fat in brooding her egg clutch, she is likely to eat the hatchlings.